What type of chocolate icing should I use? 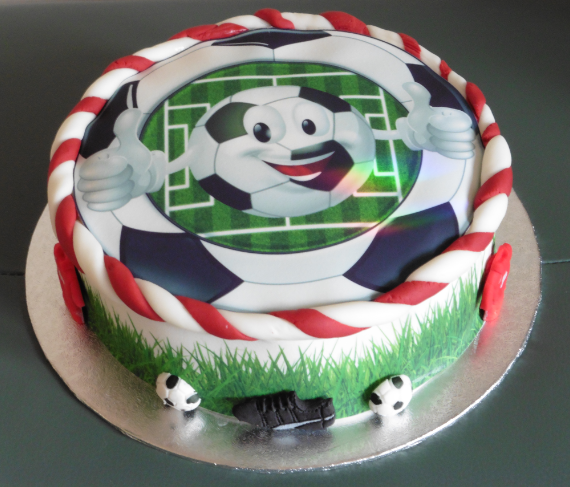 I am planning to make a cake along the lines of this one for DGD's 18th birthday. I was going to use a ganache or fudge icing for the base, but would the hot white chocolate melt it as it runs down and make a mess? Looking on the internet I see that Sainsbury's sell a chocolate ready to roll fondant, but I am loathe to go out in the car today as the snow has turned to ice on the side roads and I am on a hill. Maybe I should use white fondant, and use dark chocolate for the top, which I can get on foot from the village shop. I think that would make a better contrast sal. The light marshmallows would show up against the dark chocolate with the white icing as a bottom layer. It will look wonderful whatever you do. She is a lucky girl. sal, either would be brilliant but I'm happy to sample - just so you are sure. I'm impressed by your skill. Thank you for your thoughts. The reason I chose this design is that little skill is required ! I am a bit ham fisted these days due to the RA. little skill shysal? Looks flipping difficult to me but I am definitely no domestic goddess. Looks fabulous and I would love to make for my GD birthday. 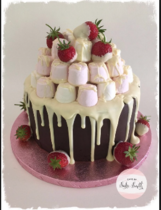 Can I make a regular choc cake then add runny icing, and how do you pile the marshmallows? Can someone give some clues please, I would be very grateful? I don't have the actual recipe, just the picture. I am making a regular chocolate cake, Lazigirl in three 6inch tins to add height, but it wouldn't really matter if shallower. I have decided to do it in reverse as suggested above and am using a tube of white writing chocolate to stick on the marshmallows. It just has to be melted by standing the tube in hot water. Had a look for the recipe but all I can find is this one. It uses whipped cream to stick on the marshmallows but I wouldn't use it if the cake will be standing out of the fridge for a few days. However you could still flood the top with melted white chocolate to drip down, and use some to stick them on, Lazigirl. Thank you so much shysal. 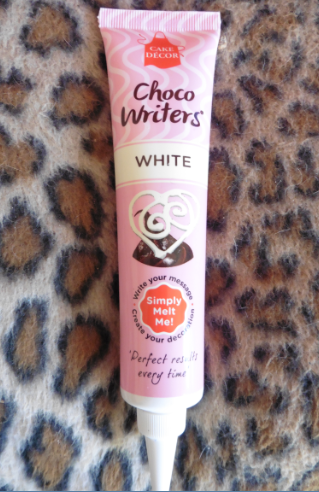 I wasn't even aware that such a thing as writing choc stick even existed! Never go near baking aisle in shops. I will give it a go, my GD is only 6 and her mother will have a fit when she sees the number of marshmallows on top. Ha ha. Would it be better to do 3 8 inch tins as 3 six inch tins will be quite a small cake?? I used to teach sugarcraft & ran a cake making business for quite some time but it was a good few years ago now- I only do family cakes now but they keep me on my toes with requests for things like the Gruffolo & all his friends IN THE WOODS! I've done a very similar cake to this one & I used pink sugar paste & then drizzled melted white chocolate over it & it worked very well. You're very talented shysal. The football cake is gorgeous and I'm no footie fan. I've noticed those with the most talent are always the ones who play their abilities down. you could do the bottom with chocolate fudge icing and pop it in the freezer to harden before drizzling your white chocolate on top and make sure your drizzle is just melted and not hot ,white chocolate doesn't like too much heat .Please put a picture on when its done I love to see other peoples cakes . Please excuse my baking ignorance but I am planning to ice with chocolate fudge icing (it's all I know) then melt white chocolate buttons for the drizzle bit. Do I need to add something, ie butter to the choc buttons to make it runny enough? Why not buy white cooking chocolate which is made for melting. It’s quite runny. Use your ganache, then put your cake in the fridge until it is cold thirty mins or so, then pour on your white chocolate to dribble over the sides, it will set straight away. Look on YouTube it will show you how it’s done. Add cream usually twice the weight of chocolate to cream. Look a bbcgood food for chocolate ganache recipe. Thanks Foxylady. I am going to give it a go armed with new found information. My main worry now is getting sides of cake smooth enough for the drips to look impressive. GD won't mind if it tastes ok I think (hope). When I came to decorate the cake I was disappointed to discover that marshmallows. like other sweets from my childhood, have got a lot smaller! I therefore had a re-think and looked for other ideas on line. This was the result. I hope she will be pleased with it despite my clumsily knocking a few of the runs. I spent a fortune on packets of items only to use a few. The remainder will be sent home with my GD, out of temptation's way, for the family to eat up or dispose of. That looks amazing shysal. I'm very impressed by the runs because it seems to me that they are the most difficult part of the decoration. I don't think I'll be posting my effort! Please do Lazigirl. I found the drips worked better than I expected, made easier by refridgerating the cake first as recommended on here by Foxyloxy. 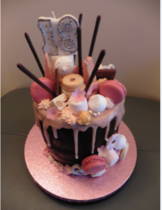 I used sparklers too, but was annoyed with myself for forgetting to choc-coat and add the strawberries which I later found in the shed where I had put the fridge contents. 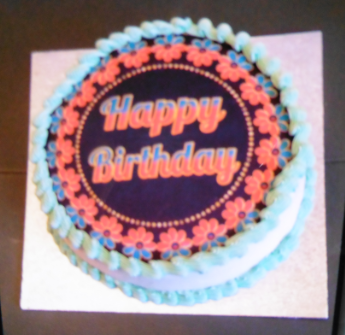 No room on the cake by then .